Having decided to resurrect my amateur radio activities, I have been daunted by the prices of equipment and gear for radio. Obviously I have been pleased to find that at least Baofeng is cheap cheap, albeit with limitations. One can get a rig that covers all bands from 160m to 70cms apparently. I cannot aspire to that at the moment, and anyway how can one do all those bands justice? I will stick to those bands that interest me, I think. 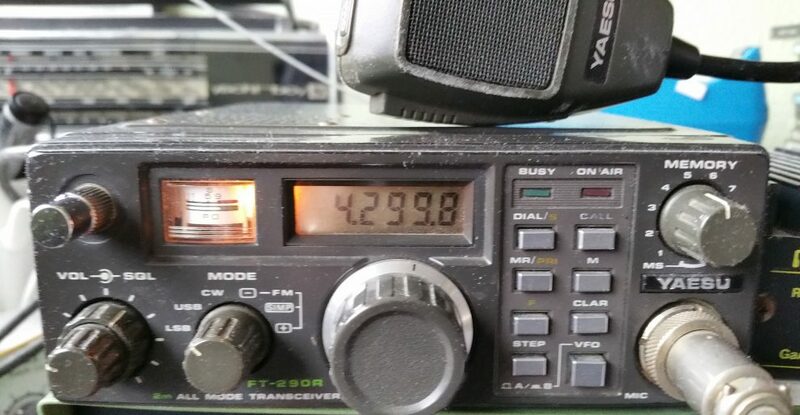 Anyway, for 2 meters I have an old FT290R multi-mode (well, actually two working quite well). For 80 to 10 have my Trio TS130V with dual VFO, which has survived well thirty years of inactivity and is working fine. I also have an old valve FT200 which may be 45 years old and is untested. I bought it in the early eighties, second-hand. My FT221R, a fine 2 meter multi-mode rig once, is also untested so far. Yes, I was mostly a Yaesu man. I had really been worried about the cost of antennas though, in addition to the long wires I am planning. However, I recently had to clear our garage through force of circumstances, and apart from two G5RVs ready made-up, I have discovered two ten-element Tonna (F9FT) antennas for 144 MHz. One of them is in its original box, never opened. I cannot remember buying it over thirty years ago. I have a portable mast, too. Then there is an intact 23 element Tonna yagi for (yes) 23cms plus the 1296 MHz transverter from 28 MHz, and the bonus, maybe 20 metres of LDF 450 Heliax cable which I used to feed the Tonna. It looks in good condition. Of course having all this is one thing. Deciding what to put up, when and how is quite another. I think the long wires and/or a G5RV should come first as they are the easiest option. Then antennas for 2 meters upwards, with a nod to planning regs, because I am a higher frequency man by nature. Now where is the 70 cm yagi? Don’t say I will have to buy one. As part of my rehabilitation in amateur radio I attended the Skills Night presented by Chelmsford Amateur Radio Society at Danbury. As one would expect, there were many Foundation and Intermediate License Holders for whom the “Skills” training is a very good idea. I found it helpful as of course the radio world has changed in my absence. Once upon a time I was familiar with the OSCAR amateur satellites (this is tautology given that OSCAR stands for “Orbiting Satellite Carrying Amateur Radio”). Stephen, M0SHQ, was very kind in giving me some minutes telling me about the latest developments, and showed me his impressive hand-held dual band 2m/70cm homemade yagi antenna, . He also demonstrated the OSCAR Android app on his phone. I have installed it on mine, and well, you never know, I might have a bash. Charlie, M0PZT, was busy programming various handheld rigs, and was kind enough to “do” my second dual-band Baofeng as he did the first. Thanks, Charlie! More experienced hams (more up-to-date than I) were scattered around the hall imparting their valuable knowledge. I enjoyed chatting with a number of the ladies and gentlemen present, and believe the attendance was over sixty in number. Anyway, the Skills Night is a cracking idea, there was a lot going on which you can see via the link, and if you are in striking distance of Danbury, do go along to the next one.